A merciless pirate who pillaged, murdered, and burned an entire town—against direct orders from the King of England—is knighted instead of given the axe. Men unable to find decent wages in England or the Colonies turn to the promise of the high seas. Pirates roam free, seeking just one ship—if the stories are true—laden with enough treasures to set up each and every crewman for life. This is the Golden Age of Piracy, a time period of 1660 to 1725, where pirates really did rule the seas. But just how much money could a drunken, one-legged sailor make from turning to a life of crime? Were treasure chests a real thing? And could pirates really make out with enough gold to last a lifetime? Imagine you’re a young man working a labor job, maybe as a fishmonger or stone breaker, somewhere in England. You’re walking down an alley after dark when someone bashes you over the head, carries your semi-conscious body onto a ship, and informs you that you will now be a crew member. You weren’t abducted by pirates; the men who shoved you into the hold were working for the Crown and you are now a part of England’s Royal Navy. Such was the nature of impressment, also known as press-ganging, a common and horribly unpopular practice which kept the Royal Navy at full strength (the pay alone wasn’t good enough to attract as many men as the Crown desired). For however long the Navy needed you, you would be at sea. This could be years, and by the time you were let back on land, you’d be changed. Perhaps your language turned coarser; maybe you’ve developed a daily taste for rum; and maybe you’ve developed sea legs that cause you to walk about town looking for work with a rolling, teetering gait. Undeniably, your skin has been sun-washed into leather, and, if you’re lucky, you aren’t covered in scars or missing a digit. The next natural step for an out-of-work Englishman, says Selinger, might be to turn to piracy, which had been growing increasingly common since the Elizabethan era of the mid-1500s. In the mid-1600s, a series of restrictive trade laws designed to halt piracy and hurt the Dutch enemy backfired. The laws restricted trade between the Colonies and England to such a degree that the quickest and easiest way to buy and sell goods was to turn towards the pirates who traded without any kind of silly regulations set by the state. As a result, piracy as an industry boomed. Even those that had jobs were looking to the seas, since many were dirt poor. In the book “The Pirates' Pact: The Secret Alliances Between History's Most Notorious Buccaneers and Colonial America,” author and pirate historian Douglas Burgess writes that the average Londoner laborer made less than £100 a year (that’s converted for 2008 pounds; it’s about £132 in 2018) during the Golden Age of Piracy. But what does that mean in terms of purchasing power? “The amount of money someone would have made in manual labor was so minuscule,” says Selinger. She says a penny during this era could buy half a loaf of bread. Twelve pennies equaled one shilling, and “unskilled laborers received a mere nine shillings a week when they could get work.” Twelve shillings equaled one pound. 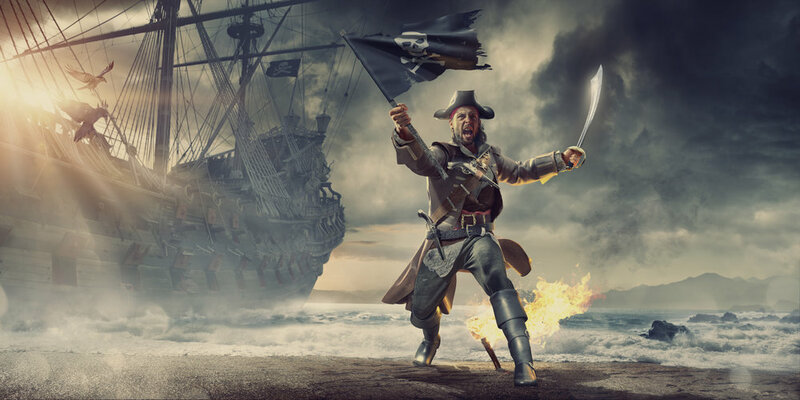 The traditional pirate—the one you imagine might serve under Jack Sparrow—is a person who wanted to hop aboard a ship, find a floating Fort Knox, plunder it, and fade away with their riches. Often they had seafaring experience—they would get selected first and paid more—but sometimes they were just regular people looking to chance it on the high seas. But then there’s the other kind of pirate, known as a privateer. Pirates weren’t just anyone who ransacked and plundered a ship on the high seas. For England, “pirates” were only pirates if they did so without a license. You could operate a perfectly legitimate business by looting other ships so long as you purchased a letter of marque, a license which let a pirate captain attack and loot wartime enemy ships and split the profits with the licensee. Privateers were also used by the Crown even during peacetime. Privateers would plunder other nations’ ships, like Spain’s, while the Crown would feign innocence and declare it the work of lawless pirates. “The closest modern cognate is state-sponsored terrorism. It shares many attributes, among them a cheap and easy way of weakening your political enemies while nominally remaining at peace and preserving diplomatic relations,” says Burgess. While England had been using privateers for a very long time, the Crown had an actual hatred of real pirates, and did seek them out and send them to the gallows (for the most part). The relationship between Colonial statesmen and pirates, however, was more complicated. In Colonial America and the Caribbean, governors sometimes found it more profitable—at both their personal bank and their respective territory—to work with actual pirates. “Every port was different,” says Selinger. In some Colonial areas, merchants were eager to trade with pirates. In Port Royal in Jamaica, the quintessential pirate town, there is reference to pirate auctions, where spoils could be bid upon at port. In areas with pirate-friendly governors, Selinger says a fee of £100 could be enough to let the pirate roam free, without fear of persecution. Pirates like Henry Teach, better known as the infamous Blackbeard, were even involved in high-level politics of North Carolina. Another pirate, Captain Tew, obtained a letter of marque under the ruse he was going to fight the French, when in reality he was going to hunt merchants along the Red Sea—and according to Burgess, his investors, including governor of New York Benjamin Fletcher, knew his true intentions. Such an open-faced ruse was probably not uncommon for Colonial governors like Fletcher, since it could be a great way to make some money, however illegal it may be. And yo-ho-ho, some of those captains did make a lot of money. And so did their crew. So could an entire crew set sail, take down a ship that was literally stuffed with treasure, and make out with enough loot for the rest of their lives? Yes, they could. Although it was rare, the way pirates distributed their wealth and took care of their own was entirely democratic. Before setting sail, each crew member would sign (usually with a circle since most were illiterate, says Selinger) a document, known as a pirate code or pirate articles, which listed that ship’s rules and treasure splits. Ship salaries, like those for the carpenter and surgeon, were also listed. So, too, were rules dictating how much money a pirate received should he be maimed or lose a limb. “They had the first workman’s comp,” says Selinger. A piece of eight, Spanish currency, was equal to about five shillings. According to “The Buccaneers of America,” published in 1684, a man who lost his right arm might receive 600 pieces of eight or six slaves. A pirate who had to embrace the peg-leg lifestyle could receive 500 pieces of eight or five slaves for the loss of a leg, while lost fingers and eyes were worth compensation of 100 pieces of eight or one slave each. As for pay, the captain was “allotted five or six portions” of the loot, the first mate two portions, and other officers paid “proportional to their employment.” After that, each crew member “from the highest to the lowest mariner” were paid equally. Even the younger boys brought on were given half a share because “it is the duty of the boys to set fire unto the ship or boat” when needed. These estimates line up with the articles of the English pirate George Lowther, one of the few surviving pirate codes. Pieces of eight were used by pirates since the Spanish dollar was accepted everywhere, “like American Express,” says Selinger. Likewise, the slave trade was extremely common, and the business of buying and selling people was just another lucrative opportunity for pirates, as terrible as that may sound today. When a pirate ship was all ready to go, they were headed out to sea, and during the height of piracy, there was only one place to go to find innumerable treasurers: the Red Sea trade routes. The Red Sea is where merchant vessels hauling all kinds of goods—fine silks, spices, jewels, dyes, intricate tapestries, silver and gold—could be found. One pirate, Captain Thomas Tew, was lucky during his brief life to find numerous treasures. In the late 1600s, he and his 60-man crew discovered a trading ship off of Madagascar. After simply frightening its crew off, he and his men were wealthier by £1,200 to £3,000 each. Later he took another ship—again without a fight—which held treasures amounting to around £60,000 ; not long thereafter, another plundered ship resulted in barrels full of jewels and a ruby-encrusted saddle, according to Burgess. He died sometime around 1695, in his mid-thirties, during a massive conflict with a Moorish battleship escorting a merchant vessel. But the biggest prize of them all went to the privateer-turned-pirate Henry Every. Every had actually teamed up with several other pirate ships to plunder along the Red Sea. Every, aboard his ship the Fancy, found and pursued the breathtaking Ganj-i-Sawai, a ship with at least 40 mounted cannons and 400 riflemen. It should have blasted Every’s Fancy to bits, but during a two-hour battle, the Fancy took out the main mast and one of the Ganji-i-Sawai’s cannons exploded, allowing the pirates to board. The Fancy managed to not lose a single man during the encounter, but they gave their opponent no quarter; a seafaring term for taking no prisoners. Estimates of the plunder—including anything worth stripping its passengers of—are between £325,000 and £600,000, or tens of millions of modern-day American dollars. Selinger says Every’s crew received a share of £1,000, the modern equivalent of $500,000 USD each. Those under 14 years old received £100, or $50,000. “Not every ship was that lucky, but you can see the allure,” says Selinger. Indeed, no ships ever were that lucky again. 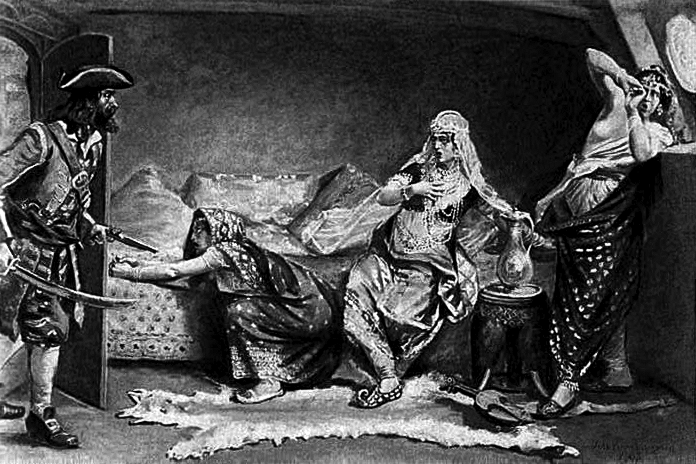 The sacking of the Ganj-i-Sawai—its Arabic translation meaning “Exceeding Treasure”—was the most successful pirate ship raid in history. If getting rich and fading into obscurity was the ideal life plan for a pirate, then Every’s crew aboard the Fancy are probably the most successful pirates in history. While Every and all of his crew were sought out, dead or alive, only 12 men were ever found and of them only six were executed. The rest of Every’s crew, somewhere around 150 men, simply disappeared. That included Every, although it’s rumored the pirate captain was cheated out of his money by merchants and died penniless. Pirates who hoped to get in and get out also had to be fortunate enough to strike at the right time. According to Burgess, by 1704 the Red Seas had become heavily patrolled. After that, “pirates were reduced to coastal scroungers, which is pretty much what they remained for the rest of the century,” he says. Still, some pirates managed to retire not only richly, but in the limelight. A Welsh pirate named Henry Morgan managed to turn an international incident to his favor. He had brutally attacked the Spanish colony of Panama City when England was at peace with Spain. The battle and ensuing raid killed hundreds, the city burned down, and King Charles II sent for his arrest. Yet upon meeting Morgan, Charles II decided he actually liked the man, knighted him, and made him Lieutenant Governor of Jamaica. Morgan had already been attacking the Spanish for some time, and Selinger says he often saved his money up after a successful pillage. “He was shrewd, smart, and brutal,” she says. He lived out his days in the modern-day equivalent of a mansion, gorging on rum until he died at 53 years old in 1688. Of course, those pirates who were smart enough to keep some plunder stashed away did tend to be the exception to the rule. “A lot of time, they went to sea, got some money, then spent it on booze and women, and then did it all over again,” says Selinger. Provided a pirate didn’t pour their profits into taverns and whorehouses, and provided they got lucky during their travels under the black flag, a pirate certainly could make better money than the average worker of the era — so long as they knew when to quit and didn’t meet oblivion at the end of a flintlock or noose.